It definitely is a happy flower! Thanks! Glad you enjoyed the Paperwhites. Those flowers are an explosion of joy! Amazing! Thanks for posting the photo! That’s a beautiful image, Patrick 🙂 We have a growing cluster of snowdrops in our front garden so I know ours is on the way 🙂 Happy 2015 to you! Thanks Jo! 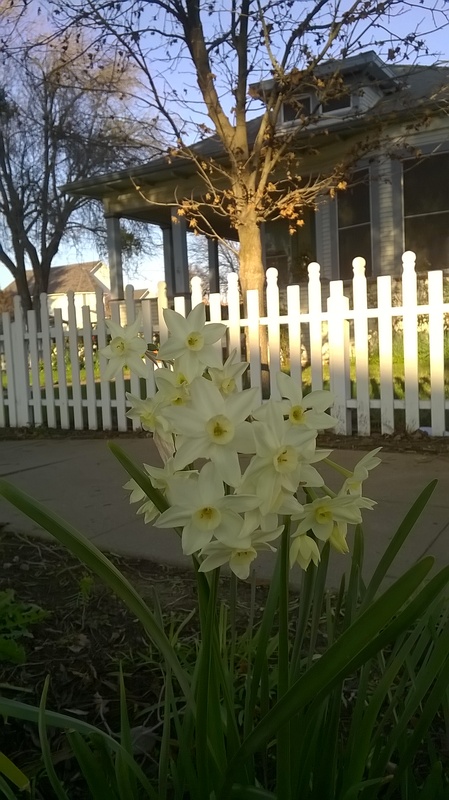 Maggie and I were just checking the front yard (being an Aussie she needs to make sure all is well) when I noticed they had bloomed. Happy 2015 to you too! Those are beautiful… as I look out on my yard sparkling with a coating of fresh-fallen snow, which is also beautiful but cold and not particularly inviting. Truly beautiful! Great shot, Patrick!